We need to better regulate child care. We Know How to Provide Good Child Care. We Just Don’t Invest Enough to Do It. A survey of all 50 states shows that most fall behind when enforcing standards of care. Can regulation help? 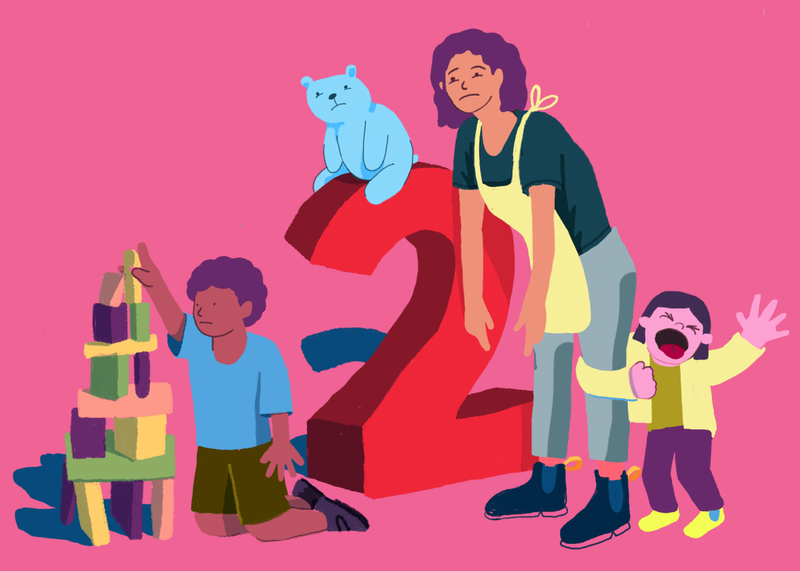 This story is part of a series on 2-year-olds produced by The Hechinger Report and Columbia Journalism School’s Teacher Project, nonprofit news organizations focused on education coverage, in partnership with Slate Magazine. Imagine that you have just entered a room with 12 2-year-olds in it. Three are using a chair as a drum. Two are taking turns snatching a stuffed teddy bear from each other, and whoever isn’t holding the teddy bear is crying. Two more are quietly looking at books, while another is scribbling in one with a black crayon. One has just had an accident in his newly minted “big boy pants” and you can smell it from where you’re standing. Two are building a block tower that is probably about to fall on top of the one playing with a toy car. Now, imagine you have been tasked with taking care of this group for the next eight hours. That means keeping them safe, clean, and fed at a bare minimum. It would be preferable if you could also play with each of them one-on-one for a while to make sure you have a clear sense of where each is developmentally. Oh, and be sure to arrange some art projects, outdoor exploration, and reading time since loosely organized activities like these help toddlers develop their self-expression, explore their worlds, and learn basic pre-academic skills. Don’t forget that children’s brains are 80 percent developed by age 3, so the experiences you provide will affect their brain structure for the rest of their lives. No pressure. And yes, of course you’ll be paid: $9.77 per hour, the national average for child care workers. For caretakers in at least seven states, including Louisiana, Maryland, and New Mexico, this scenario is not imaginary. The maximum legal adult-to-child ratio for groups that could include 2-year-olds in these states is set at a maximum of 1:12—the highest in the nation. In a least 23 states, including Florida, Kansas, New Jersey, and Washington, it’s 1:10 or higher. None of the above regulations match the maximum ratios recommended by the National Association for the Education for Young Children (NAEYC), an organization focused on improving the quality of care for children under the age of five. For groups where at least some of the children are 2.5- to 3-years-old, NAEYC recommends no more than nine children per adult; the recommended ratio drops to 1:6 when some children are younger than 2.5 years old. States consider a range of different factors in coming up with ratios, such as the number of older children in a group and the type of child care facility in question, making apples-to-apples comparisons difficult. The ratios reported above represent the maximum number of children one adult could watch if at least one child in the group was 2 years old. Only 18 states meet or beat NAEYC’s standards for the entirety of the 2-year-old year, according to a 50-state scan by the Teacher Project and the Hechinger Report of licensing requirements for child care programs in each state. It’s not just the standards for adult-to-child ratios that are inadequate. While most states have basic safety regulations in place that specify things like cleanliness of diapering areas, and storage of potentially toxic cleaning supplies, and that someone on staff hold first aid and CPR certifications, there are few regulations governing what constitutes educationally enriching and developmentally appropriate care for 2-year-olds. Few states have rules that would compel providers to read to children, for example, or provide toys that have been shown to help children learn math concepts. The Hechinger Report–Teacher Project review found just six states that require caretakers to follow clear guidelines on developmentally appropriate learning strategies for children from birth to age 3. Delaware, for instance, mandates that caregivers at licensed child care centers follow lesson plans based on age-specific educational guidelines put together by the state’s Department of Education. The guidelines lay out learning strategies for children from birth to 6 months, 6 to 12 months, 12 to 24 months, and 24 to 36 months. One of the primary goals for 2-year-olds is to help them learn to use sounds, gestures, and actions to communicate their wants and needs. A caregiver should draw their attention to facial expressions and gestures made by other children, for instance, by saying something like, “Look how happy Sarah is that you shared your crayons with her,” as outlined in the guidelines. The guidelines also cover age-specific goals relating to memory, problem solving, and self and social awareness, among other areas. In most states, such guidelines are provided as an optional, rather than required, resource. In fact, many of the documents, like Massachusetts’, explicitly state that the standards should not impact the state’s child care regulations. Since 62 percent of 2-year-olds had working mothers in 2016, according to U.S. Bureau of Labor Statistics data, most are cared for by providers other than parents for some portion of their day. The lack of clear standards helping to shape what that care should entail has created an uneven system of care based on a fairly low bar for quality. “The basic measure for what states want for infants and toddlers is not too great in this country,” said Patricia Cole, who oversees policy in areas affecting early care and learning at Zero to Three, a D.C.-based nonprofit. Early childhood experts like Cole don’t recommend a rigid system of tightly defined learning targets for 2-year-olds. It’s most appropriate for caregivers to respond to young children in developmentally appropriate ways that facilitate their exploration of the world around them. But lower staff-to-child ratios and better enforced guidelines on developmentally appropriate learning could help them do that. The lack of clear system likely stems from the deep American ambivalence over how much government should intervene in the lives of very young children and how much should be left to families, said Rhian Evans Allvin, executive director of the National Association for Young Children. Brain development is a complex process and isn’t thought to be complete until age 25, according to cognitive development experts. Nevertheless, a massive amount of development takes place in the very early years. Synapses—the connections that allow different parts of the brain to communicate—develop rapidly and can be affected by a child’s environment, as explained by the Urban Child Institute, a Tennessee-based nonprofit focused on promoting children’s health. By age 2, children have developed 200 percent more synapses than they will have as adults, since part of a growing brain’s work is to prune connections that aren’t used. Since synapses strengthen with repeated use and strong connections are less likely to be cut later, which synapses get strengthened as a toddler can make a big difference in the long-term wiring of the brain. “Genes provide a blueprint for the brain, but a child’s environment and experiences carry out the construction,” the Urban Child Institute report states. Most of a young child’s experiences are dependent on the older people he or she interacts with throughout the day. However, the Hechinger Report–Teacher Project scan also revealed that most states are not aggressive in ensuring child care programs hire highly qualified staff. Indeed, only a handful of states require caretakers of 2-year-olds to have any specialized knowledge in child development. A 2016 state-by-state analysis of early childhood employment conditions by the Center for the Study of Child Care Employment at the University of California, Berkeley confirms that finding. In most states, anyone with a high school diploma is eligible to work as a child care provider. Twenty-three states have absolutely no minimum education requirements for home-based child care providers. The challenge with upping requirements on caregivers to ensure quality care is that their pay is often minimum wage or only slightly higher. In fact, most child care workers earn about the same as fast food cooks and 15 percent live in poverty, according to the Economic Policy Institute, a nonpartisan think tank. In every state, child care workers would need to spend more than half their income to pay for center-based child care for their own two children, according to a 2016 report on the cost of care nationally by Child Care Aware, an organization advocating for more family-friendly child care policies. Given the low pay and the extensive demands of the job, very few child care providers find attending to the needs of large groups of small children for a few dollars an hour to be a tenable long-term job prospect. The field is notorious for its high turnover, according to Marcy Whitebook, who heads Berkeley’s Center for the Study of Child Care Employment. It’s not that we don’t know what better standards look like. The United States Department of Defense has been recognized for its ability to provide consistent high-quality care at the hundreds of child care centers it operates for families of military personnel in the U.S. and abroad. The DOD establishes ratios, group sizes, health and safety standards, and stringent training requirements for staff caring for toddlers. Every staff member is required to complete foundational training that covers 15 topics relating to toddler care, including cognitive development and family engagement. In subsequent trainings, staffers gain deeper understanding of developmentally appropriate practices, like how to encourage strong verbal growth and gauge a toddler’s attention span, among other relevant topics, said Carolyn Stevens, director of the Office of Military Family Readiness Policy. “Sometimes we tend to underestimate what our 2-year-olds can learn,” Stevens said. “Learning to pour milk into a cup, serving themselves a portion of a meal—these are all connected to promoting life skills” that children are ready to start practicing at a very young age, she said. More recently, the DOD has been working with researchers at Purdue University to develop curricula that separately addresses the needs of infants, 1- to 2-year-olds, 2- to 3-year-olds, and 3- to 5-year-olds. Of course, just changing the rules wouldn’t be enough to fix the country’s child care quality problem. Upping the academic standards without corresponding support and training for caregivers could be an exercise in futility. And adhering to the high-quality standards recommended by advocates would cost a lot of money: Paying qualified caregivers to work with fewer than nine children at a time is not cheap. Any effort to improve regulations would have to go hand-in-hand with an effort to find new revenue sources and increased political will. Still, tighter regulations would set the bar higher and could galvanize governments into doing what’s necessary to meet that bar. Right now, the bar is so low in most of the country that a 2-year-old could step over it. Zoë Kirsch and Sarah Butrymowicz contributed reporting for this story.